Get outfitted, get trained, get inspired—get going. The world is waiting. Join us in May outside Flagstaff, Arizona, or in October outside Asheville, North Carolina, for the world’s most unique event for do-it-yourself adventure travel enthusiasts, with hundreds of session-hours of classes for 4-wheel-drive and adventure motorcycling, inspirational programs, the Overland Film Festival, roundtable discussions, demonstrations, food, and a large expo featuring over 150 vendors of adventure travel equipment, camping gear, bikes, vehicles, and services. So I did just that. 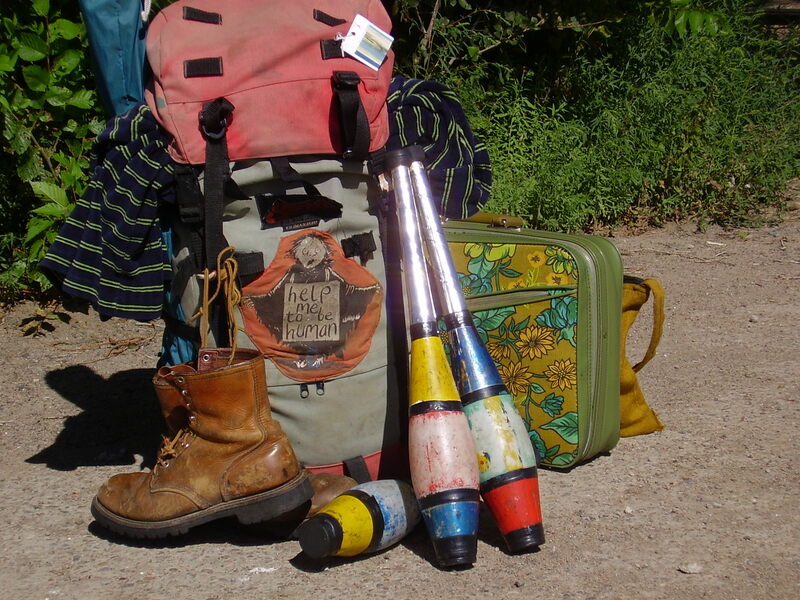 I joined the Expedition Portal website and found a community of like minded travelers, reminding me of the years Ive spent on the road, living out of a backpack in my twenties for four years here in the States. 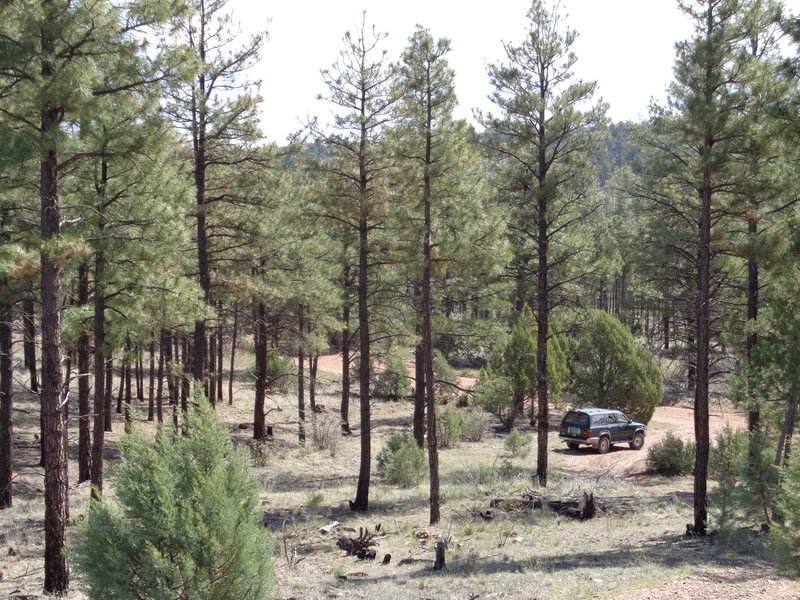 After stopping just north of Show Low, AZ, for a lunch break, we drove down FS 332 and took a hike and stretched out the kinks from sleeping in the truck in the rain. The dogs slept better than I did. They had energy to play. Back on US 60, to US 260 to 87 North where a semi almost ran us off the mountain pass. I was glad to get off the busy highway, it had suddenly been full of racing traffic from Show Low onwards and after a leisurely drive until then, I couldn’t relax. I took CR3 Lake Mary Road north and almost missed the turn off to Mormon Lake. Thick clouds covered the highway and snow fell. I had to concentrate on driving. We slowly drove past Mormon Lake there the Expo gathering was building momentum in the soggy muddy campgrounds. Roof top tents, Sportsmobiles, Earthroamers, trailers, Jeeps, and people huddled in rain gear walked around the site, talking to the vendors and travelers alike. I wanted to set up camp first incase the snow really hit hard. Up the road we turned into the National Forest for Dairy Springs Campground. I’d reserved a site and I’m glad, it was one less thing to take care of. 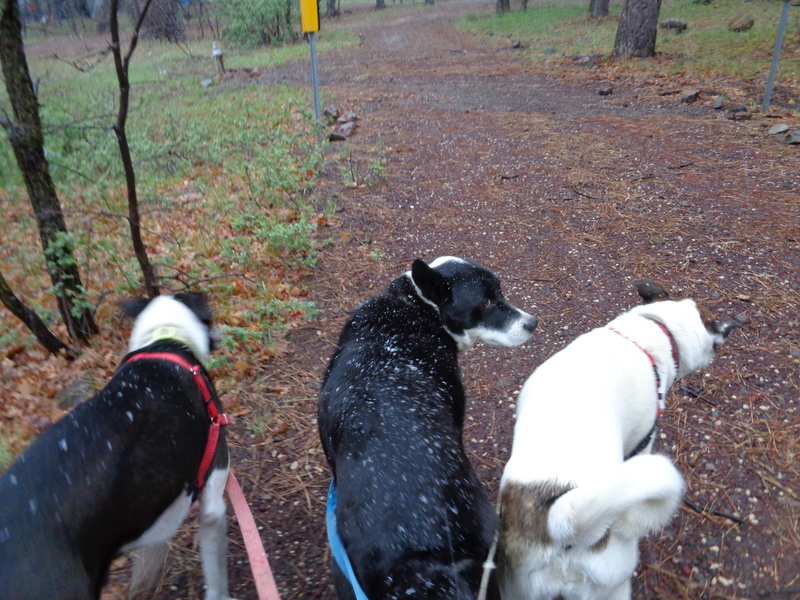 Leashes out, I took the dogs for a quick walk in the sleet before tackling the tent.